Slackline Uk - Equipment, information and events. This is a question that is asked of us time and time again whenever we rig our kit in the park or on the beach. So, we decided to make an online guide to help to increase awareness & knowledge of this incredibly fun and simple sport. 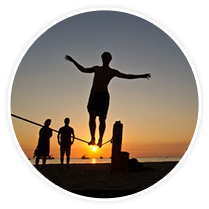 A Slackline is simply a piece of polyester webbing. Usually between 2 and 5cm wide and 15 Metres or more in length. A full slackline kit will usually include at least one ratchet to allow the user to secure the ends of the line to any stable points (posts, trees etc.) and then use the ratchet to tension the line. The aim is to balance on the line and walk along it. Unlike tightrope walking, the line is not supposed to be absolutely rigid. Instead it is preferable to have some slack in the line (hence the name of the sport) which allows the line to move a little as the Slackliner walks along it. The real skill then is to anticipate these slight movements of the line and move your body to compensate for them, improving your balance and core strength. 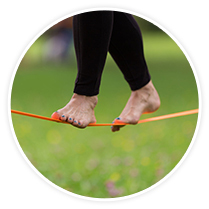 Visit our Slacklining For Beginners page for a tutorial to help you get started. Once the basics of balancing have been mastered then the sky is the limit! 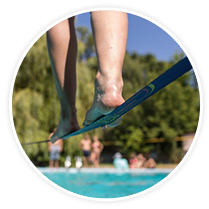 It is possible to perform all manner of static and dynamic tricks on the Slackline and this is where the fun really begins. A special type of line known as a trickline is an absolute favorite of many slackliners and this type of line can really be thought of as a cross between a tightrope and a trampoline. But at just 5cm wide and usually 31 metres long with a twin ratchet system to allow more tension, this is like a portable trampoline that can be carried around in a shoulder bag and setup anywhere that has two stable points for anchors. Parks, beaches, gardens, festivals, gymnasiums and sports centre’s etc. Make sure you checkout our tricks tutorials showing how to perform tricks on a trickline. They will have you bouncing like a pro in no time. Other types of lines include Longlines, Highlines and Rodeo Lines. Slacklining is rapidly becoming a truly global sport. We have been lucky enough to personally witness and even take part in Slackline events in various countries across the Globe. Mexico, Brazil, Argentina, Thailand, Singapore, South Africa and Spain to name just a few. If you love outdoor exercise in remote and exotic locations then this is a sport that you should certainly become involved with. Many online retailers stock the equipment and this is where the best price deals can be found. Amazon often have some very cheap deals on a wide range of lines and associated equipment such as Racks, Stands, Pulleys etc. It's also very useful to be able to read the product reviews from people who have purchased and used the equipment to help you decide if it is the right choice for you. Maverick Slacklines a company based on the South Coast of England are a respected UK Brand. Their Maverick Pro system trickline comes highly recommended. HopOn Slackines are a US based company with a great selection of quality slacklines and accessories. Gibbon Slacklines are a huge global brand and have a wide range of kit available from their distribution network in countries all over the World. Checkout our Slackline Equipment guide to help you decide which bits of kit you need to get started.